A precedent-setting ruling by a Jerusalem civil court judge, handed down this February in response to a lawsuit filed by Ohr Torah Stone's Max Morrison Legal Aid Center and Hotline for Women, is a landmark step in helping women obtain Jewish divorces from recalcitrant husbands. The decision, by Justice Ben Zion Greenberger of the Jerusalem Family Court, asserts for the first time that a woman whose husband denies her a get, or Jewish bill of divorce, can demand damages in civil court for his malicious withholding of her right to remarry, have children and determine her own destiny. Representatives of the Center filed their suit on behalf of G., whose husband, S., had refused to give her a get even after a decade of living apart. Ignoring a rabbinical court order to grant the document, S. persisted in his attempts to blackmail G. into waiving her rights to child support and the marital home. The lawsuit, which argued that S. had inflicted personal injury to G. by taking away her freedom, achieved its intended result - and more. The husband agreed to grant the divorce if his wife withdrew her case against him. And, in a dramatic twist, as G. received her get at last and agreed to drop charges, the civil court judge threw out S.'s motion to dismiss his wife's claim for damages. "The infringement upon the autonomy of a woman that is caused when her husband refuses to give her a get is cause for legal action under the Israeli Torts Ordinance," Judge Greenberger ruled. This creative judicial milestone "is the beginning, not the end" of the Max Morrison Center's efforts on behalf of agunot, says attorney Susan Weiss, director of the Legal Aid Center. "Once the civil courts recognize that chaining a woman to a marriage is basis for damages, the rabbinical courts might reach more creative solutions as well." Weiss has composed a list of requests that the International Coalition for Aguna Rights presented to the rabbinical courts in March. Among them: separating divorce decisions from custody, alimony, property or monetary issues; jailing recalcitrant husbands; granting a forced get in some cases when a husband refuses; annulling marriages in which the wife was deceived about her spouse at the time of marriage and improving the efficiency and functioning of the rabbinical courts. 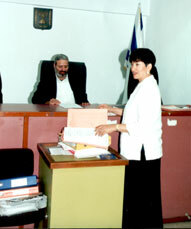 The Max Morrison Legal Aid Center and Hotline was established in Jerusalem in 1997. Since then, it has expanded to include a center in Safed as well as the Caroline and Joseph S. Gruss Regional Center in Tel Aviv. In an episode that could have been written for a motion picture, Max Morrison Legal Aid Center director Susan Weiss and rabbinical court advocate Sarah Markowitz recently used quick thinking - and fast running - to obtain a get for their client. The two women chased the aguna's husband through the streets of Jerusalem as he attempted to escape imprisonment for denying his wife a divorce. The unusual incident took place during a rabbinical court hearing this past February on behalf of a woman whose husband had withheld a get for 11 years, despite a rabbinical court order six years ago that he grant the divorce. At the hearing, the rabbis warned that if the man continued in his refusal, they would have him arrested and imprisoned for five years. The defendant heard the decree - and bolted from the courtroom. "None of the court guards ran after him; no one called the police," Sarah Markowitz told Jerusalem Radio after the incident. "We realized that if we didn't physically catch this man, he might literally disappear and his wife would never, ever be freed." Markowitz and Weiss chased the man for several blocks and when he attempted to board a bus, one of the women put her fingers in her mouth and emitted a sharp whistle. Hearing the noise, the driver of a passing police car swerved onto the sidewalk, blocking the man as the door of the bus slammed shut. "We're very pleased that as a result of our persistence, the man finally agreed to give his wife the religious divorce she needed to resume her life," said Markowitz. "But it's sad that it took a media-worthy debacle to finally make it happen. We hope that this story will call attention to the cases of all women in Israel who are being held hostage by their husbands."